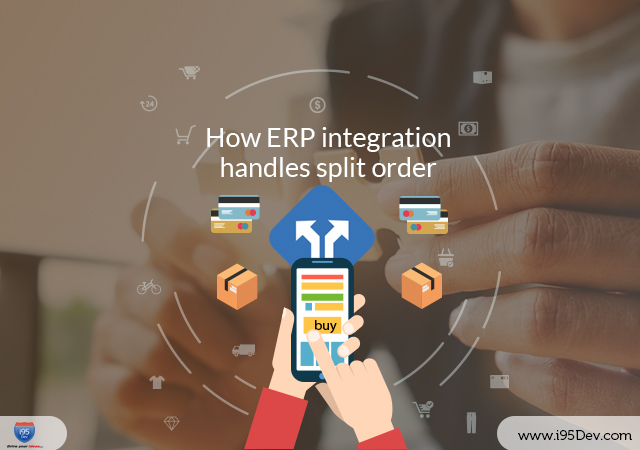 How ERP integration handles split orders? Have you been facing challenges in handling the ability to meet customer demands? You are not alone! A study states that about 52% of the organizations face the same problem as you. Many e-commerce companies are inclining towards constantly evolving themselves to keep up with the growing demands of online buyers. Keeping up with the multiplying growth in orders is not as easy as it seems. Research states that almost 58% of the e-commerce companies assert that inventory management is the #1 area of their fulfillment and distribution operations they need to improve. About 56% say that their ERP is not very efficient and is not meeting their needs as an end-to-end order processing solution. The most common challenge all of these e-commerce companies face is managing the order and inventory. Most, of the e-commerce players, are using the method of splitting orders to maintain their inventory. “Split Order” is precisely splitting an order into separate orders. The items in an order are split into multiple orders with unique order id automatically based on product attributes or the number of items added to the cart. With different order ids, it is easier for the customers to view all the order ids in their Order History and track them separately. Nearly two-thirds say they are only “somewhat satisfied” with their fulfillment and order-taking methods, while almost 15% claim to be dissatisfied with their order handling methods. The speed and velocity of orders moving through the typical warehouse or DC— driven mainly by Omni channel distribution—is also impacting warehouse managers’ opinions of their facilities’ levels of efficiency and effectiveness. Why do B2B companies Split Orders? Order and Shipping splits can make the order and inventory management hassle for the e-commerce companies and save the money for the customer and simplify the shipping process. Here are the most common issues companies face while managing the shipping of the orders received. B2B companies can address all of the concerns as mentioned above by just splitting the orders. However, it is essential to keep the customer informed about the separate shipments and their delivery date to erase any misconceptions from the customer about their orders. Read about Inventory Management with Magento Sage 100 Connect. By splitting the orders, you manage the orders efficiently as you get unique order ids which you can track. The invoices and shipments for each order id are also generated separately. The Shipping charges and the taxes are split based on the items. You can enhance the delivery speed of the products in stock. Splitting orders help you cut the cost, reduce the delivery and maintenance time. Faster delivery and improved order management will yield in better service and in turn help in increased sales. Individual item tracking and unique order id will enable your customer to keep tabs on all their orders. This will help you end up with a happy customer. A leading home décor company that provides lighting, furniture, and decorative products that are aligned to the design-trade clientele. The client has been facing the challenge of managing the order and inventory. Our client wanted a robust e-commerce platform for their customers who in this case are other companies. They wanted this e-commerce platform to stay seamlessly aligned with their existing ERP system as they were facing a constant issue of updating their e-commerce platform and their ERP system. This, in turn, affected their order and inventory management. They wanted an integration solution that could bring in scalability, flexibility, and can significantly improve customer experience and enhance their business value. Know the 6 Inventory Management Challenges E-commerce ERP Integration can help you Overcome. Wouldn’t you agree if I told you that having a constantly updated and coordinated systems would solve the problem? When an e-commerce company fails to deliver a product, due to the lack of integration between their internal systems, it affects the customer experience which is not happy news for the e-commerce company. However, a little attention to the backend systems can change the scenario and solve the challenges B2B e-commerce are facing. Splitting orders improvise the order and inventory management. The question then comes to how effectively are the internal systems integrated. It is essential that e-commerce companies who have multiple warehouses have centralization of the orders. This will make tracking of orders easier for the retailers as they can avoid duplication. Assigning a unique id for each ordered item with also erase any overlapping. How has i95Dev implemented Order Splitting? To address the challenges faced by B2B e-commerce Company, there is a need for a great solution. i95Dev is a one-stop solution to resolve these issues. i95Dev’s ERP connectors help you keep your systems updated instantly. This provides complete control and visibility of your order and inventory management with seamless connectivity across multiple channels. We have implemented a seamless integration between the Magento platform and the ERP system. We have connected the two systems wherein any update in one of the systems say ERP, gets updated automatically on the other system, Magento. We have minimized the order aging by automating the order movement from Magento to ERP system. E-commerce companies will no longer have to worry about losing customers because of delays in order fulfillment. i95Dev has connected inventory across multiple channels with the i95Dev ERP connectors. Orders don’t come in from a single store. So, there are numerous orders to track. By assigning a unique id for each of these orders, tracking them can be easier. However, lack of coordination between the systems can lead to mishaps. i95Dev helps e-commerce companies to keep track of all their orders coming across from any channel. A study states that “More than one-half experience process failures with either their own internal operations or in collaborating with suppliers.” This brings us back to the fact that there needs to be a proper integration between the systems to maintain the coherence and provide excellent customer experience. This cannot be easy unless companies have a one-stop solution. i95Dev works towards providing a problem-free e-commerce ecosystem for the companies to excel without worrying about the trivial issues that are important. Talk to us today to gain an understanding of how we can integrate your e-commerce Magento platform with your ERP system to boost your company’s business efficiency.